This well-run introduction to the World of Drifting is an eye-opening thrill ride from start to finish. Check out the Drift School video! This well-run introduction to the World of Drifting is an eye-opening thrill ride from start to finish. You'll undergo structured training in two of the core skills necessary to master and control drifting. 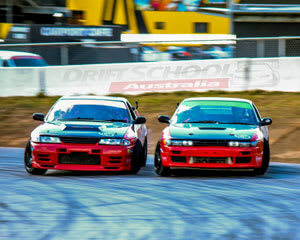 After a briefing on general drifting principals and safety, you will be strapped in alongside with professional instructors to show you how it’s done, before you take the wheel yourself to learn and perform techniques such as Drift Handbrakes Turns and Controlled Drift Donuts. You will then be strapped in a Professional Competition Drifter who will take you on a thrill ride of your life in a real, head-to-head Drift Battle! 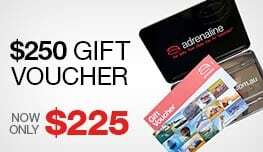 There's plenty of driving time in a variety of purpose built cars including: Nissan 180SX, Nissan Silvia S13, Nissan Silvia S14, Nissan Silvia S15, Nissan Skyline R32, Nissan Skyline R33, Holden Commodore and Ford Falcon. Cars and instructors are fully equipped to deal with the punishment. 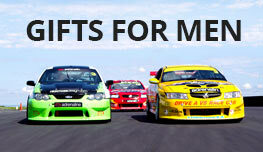 Come and drive our cars, with our tyres, all in a safe, race track environment. This course is a thrilling experience with great instructor/student ratios and with plenty of hands-on driving. And it’s not just for the boys – up to 40% of the participants are girls! There will be a maximum of 40 participants in each session. Course time varies between 30-60 minutes depending on student numbers. The order of proceedings and session length may vary based on numbers on the day. Courtney was brilliant, patient and encouraging. Would have liked longer time to practice everything more. Was great fun, however the fun was a total of 5 minutes. Not enough driving time , expression session would have taken but too long a wait was 50mins. It was a great experience! instructors were very helpful and got us plenty of time in the cars! Drift school was awesome, great bunch of guys and gals. good intro to most adventures.